For many brewers around the world, creating a delicious beer is the ultimate goal – but that's not Brewgooder's only aim. 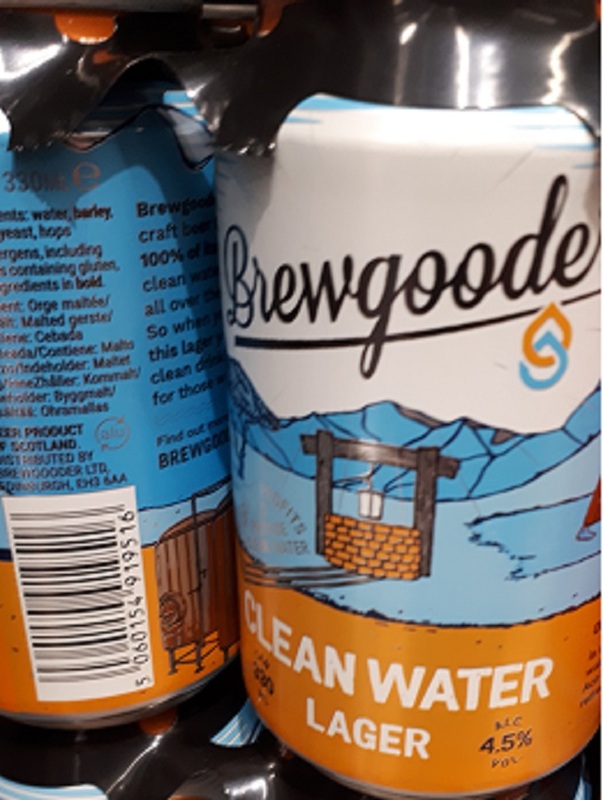 Sure, this Scottish craft beer company wants to produce the perfect craft lager, but they also want to bring one million people clean and safe drinking water. After launching in 2016, Brewgooder recently shipped its one millionth can. Last week the company received Scottish Government support to help establish its headquarters in Edinburgh and take its hoppy offering around the world. So what’s the connection between beer and water – besides the obvious? Well, the incredible thing about Brewgooder is that they donate 100% of profits from their craft beer sales to clean water charities in some of the poorest parts of the world. They do this in part thanks to the help of Scottish brewing legends, Brewdog, who brew their beer at zero margins, allowing them to maximise the amount of money that helps those in need get access to safe drinking water. The facts are stark – a massive 844 million people around the world do not have access to a clean water supply, and every minute a new-born child dies from an infection caused by lack of safe water and an unclean environment. The company launched on World Water Day in 2016, a day for the global community to come together to highlight the importance of freshwater. Since then, they’ve helped to fund 60 projects for over 40,000 people and want to push this number up to 100,000 by 2019. That 844 million figure felt a lot closer to home for founder Alan Mahon after catching a waterborne parasite during a trip to Nepal. Luckily for him, he was able to gain access to the medicine he needed to heal quickly, but he also realised that many people aren’t as lucky. In some parts of the world, it is a sad truth that just drinking a glass of water means risking your health every single day. Brewgooder is just one of the growing number of social enterprises in Scotland. These companies put social goals alongside their business objectives and try to make a positive impact while also having a focus on profits. The Social Enterprise World Forum is due to take place in Scotland in September, bringing companies together from around the world that are making a difference to people and the planet. Alan's mission is to bring social enterprise brands into the mainstream, and if Brewgooder’s success is any indication, people are starting to embrace companies that care about more than their bottom line. Brewgooder became the first social enterprise brand to gain a national listing with Asda in October 2016, just three months after launching their Clean Water Lager with a successful £60,000 crowd fund. Now it’s stocked by over 1,000 shops across the UK and is still continuing to grow. The incredible growth of Brewgooder is proof that not only do people love a good craft beer, but they love supporting a good cause. Alan’s support for social enterprises goes far beyond his work at Brewgooder. He was also involved with the growth of Social Bite, another of Scotland’s incredibly successful social enterprises. Social Bite and its founder Josh Littlejohn is dedicated to the cause of ending homelessness in Scotland and the chain of high street sandwich shops and restaurants employs, trains and houses some of Scotland’s most vulnerable people. He has also supported Sleep in the Park, which raised an incredible £4 million and released 500 houses for rough sleepers in Scotland at the end of 2017. Alan is relentless in the pursuit of his goal – to show people how the power of choice can be harnessed to democratise philanthropy by making everyday consumption habits acts of charity. Alan believes that drinking good beer can help make the world a better place – and who are we to argue? Grab a beer with a friend, help people in the developing world get access to the clean drinking water that they need. We’ll drink to that.